Artem Vakhitov defeats Saulo Cavalari in the main event of Glory 38 kickboxing promotion on Friday February 24 in Chicago. 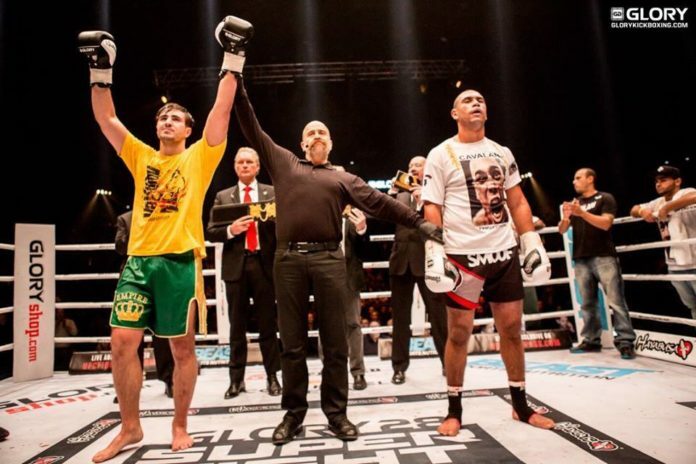 Reigning kickboxing light heavyweight champion Artem Vakhitov of Russia and the number one contender, who is also a former title holder, Saulo Cavalri of Brazil squared off in the decider fight. In their first encounter in 2015 Brazilian took the win via a split points decision. A year later Russian paid back claiming a unanimous decision as well as became a new champion. It has all come to the conclusion at Glory 38 Chicago live on ESPN. Vakhitov stopped Cavalari with strikes in the second round at 2 minutes 43 seconds. As an ultimate result he retains his title for the second time. Last November Russian fighter stopped Zack Mwekassa of Congo in the second round. In the co-main event Antoine Pinto took a split judges decision (29-28, 28-29, 29-28) against Richard Abraham. The fight card also comprised the four-man light heavyweight contender tournament. In the first semi-final Zinedine Hameur-Lain eliminated a reserve fighter Brian Collette with a punch, 14 seconds before the end of the fight. Hameur-Lain was previously matched to face off Zack Mwekessa who was pulled off due to the medical issues. In the second semi-final Ariel Machado earned a unanimous decision (30-26, 30-26, 30-27) over Danyo Ilunga. In the final Machado KO’d Hameur-Lain with the left hook to the body at 2 minutes 43 seconds of the first round, consequently winning the tourney. In the headliner Benjamin Adegbuyi and Anderson “Braddock” Silva went on distance. Moreover an extra round was applied. As a result Abdegbuyi won the fight via a unanimous points decision (39-35, 38-36, 38-36). Also on the night Catalin Morosanu claimed a TKO victory over Maurice Greene. The referee stopped the contest at the mark of 23 seconds in the second round. Similarly Murthel Groenhart stopped Thongchai. It was all over at 1 minute 45 seconds of Round 3. In addition Daniel Morales earned a unanimous decision over Pawel Jedrzejczyk (30-27, 30-27, 29-28), as well as Niclas Larsen defeated Lukasz Plawecki (30-27, 30-27, 30-27).